Back by popular demand from SRS Cinema is Tim Ritter's Super-8mm movie DAY OF THE REAPER. If you missed out the first time on the now out of print HD release DVD and Bluray then now is the time to make sure you don't make that mistake again. 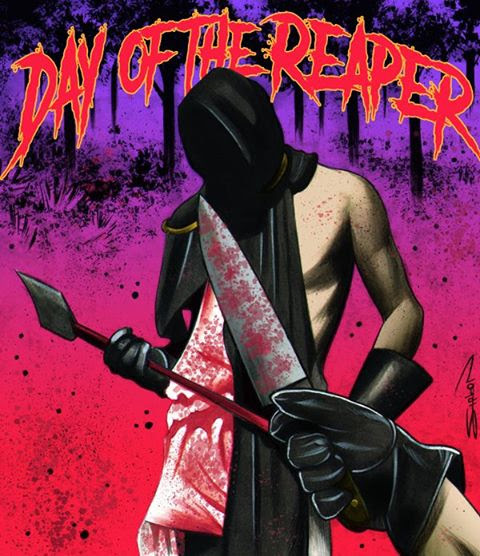 So get ready, because DAY OF THE REAPER is back! It’s the same HD version from the first release, and is available once again on Bluray and DVD (but with new art). PLUS this time, it is receiving its first ever VHS release of the HD cut. Five women on vacation are stalked by a hooded cannibal killer in the town of Sunnyville Florida. Tim Ritter’s first flick, shot on super 8mm when he was a teen, given a 2k transfer from the original film negs. Copies are expected to ship mid to late Dec 2017. This will likely be the last release of this cult hit, so make sure you don't miss out.